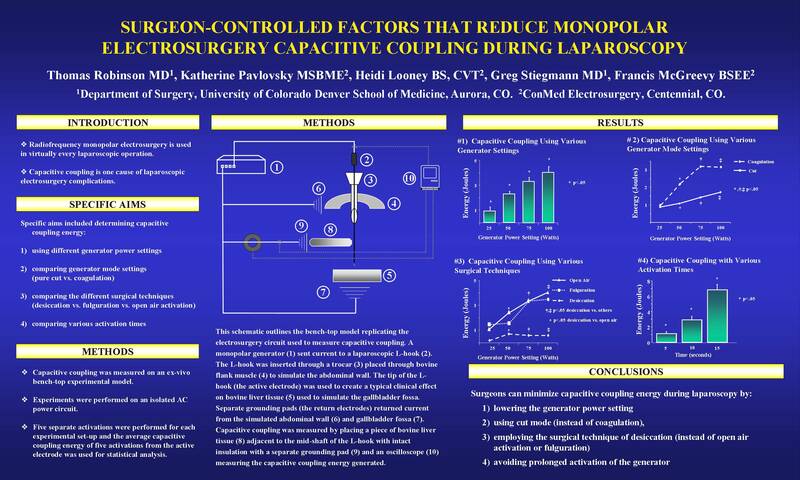 OBJECTIVE: To determine factors that can be modified by the surgeon to reduce monopolar electrosurgery capacitive coupling (CC) during laparoscopy. BACKGROUND: Monopolar electrosurgery is used in virtually every laparoscopic operation. CC is a major cause of laparoscopic electrosurgery complications. SPECIFIC AIMS: To determine CC energy: (#1) using different generator power settings, (#2) comparing generator mode settings (cut vs. coagulation) (#3) comparing the different surgical techniques (desiccation vs. fulguration vs. open air activation), (#4) comparing various activation times. METHODS: Two oscilloscopes determined energy (Joules) of CC that was measured using liver tissue adjacent to an L-hook instrument’s mid-shaft with intact insulation on an isolated circuit using two different generators. RESULTS: (#1) For different power settings, CC energy (Joules) was: 25 Watts (1.1±.7); 50 Watts (2.4±.5); and 75 Watts (3.3±.6) (*p<.05 for all comparisons). 5 second activation (1.1±.6), 10 second activation (2.9±1.0) and 15 second activation (6.8±1.5) (*p<.05 for all comparisons). ••• Results for specific aims 1 through 4 were similar for both generators tested. CONCLUSION: Surgeons can minimize CC energy during laparoscopy by (#1) lowering the generator power setting, (#2) using cut mode (instead of coagulation), (#3) employing the surgical technique of desiccation (instead of open air activation or fulguration) and (#4) avoiding prolonged activation of the generator. These practical findings may modify the surgeon’s use of monopolar electrosurgery to reduce the occurrence of CC.